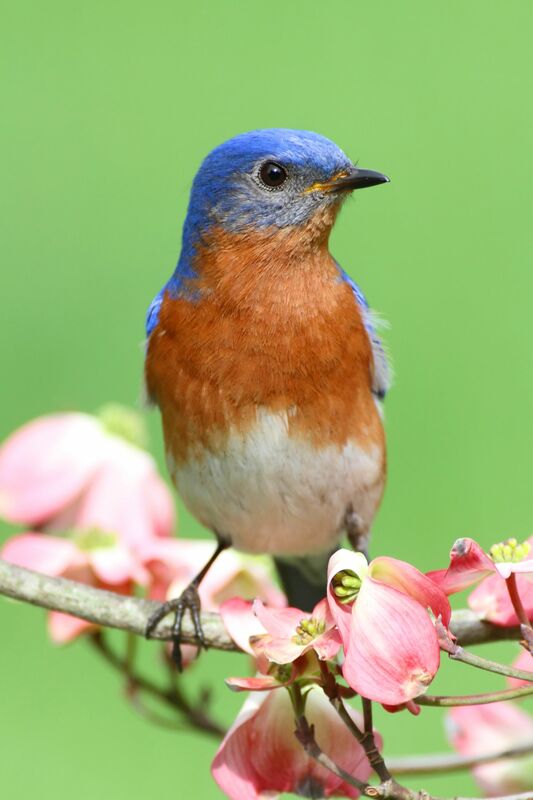 The beautiful Eastern Bluebird has long been a harbinger of spring and favorite among bird lovers. It’s gentle disposition, cheerful song, and willingness to nest among human activity has endeared them to people in Michigan for years. But as a native cavity-nesting bird that needs tree hollows or other natural enclosed spaces to nest, they have struggled in the last 100 years from habitat loss, farm chemical use, and competition with non-native species. These factors almost resulted in bluebirds disappearing from many areas of Michigan by the late 1950’s. Human intervention was needed to help them thrive once again. Fortunately, it was learned years ago that bluebirds will readily nest in human-provided nest boxes. A quality-made wooden box, mounted on a metal pole and placed in a grassy, open habitat is just what bluebirds are looking for. These colorful members of the thrush family thrive in farmland, open suburbs, meadows, fields, and golf courses, to name a few places. Nest boxes should have 1 ½” round or oval entrance holes and be at least 5 inches deep or so. And very importantly, nest boxes need to have a way to open them up and see what is going on inside. Just putting up a nesting box is not enough to ensure bluebirds’ success. Nest boxes need to be actively monitored or checked. This means opening the box once or twice a week to monitor the progress of native birds, look for potential problems, then solving them. This can involve looking for signs of predation, infestations of parasites, or stress from heat or cold among the young birds. Actively monitored boxes result in greater fledging rates of young birds. You can also attract bluebirds by providing water. Bluebirds readily bathe in water or will drink it year-round. A simple birdbath is all you need. Bluebirds are also looking for food in our yards. In addition to planting berry-producing shrubs and trees on your property, consider putting out a bluebird feeder. Bluebirds’ favorite feeder food is mealworms – either live or dried. They prefer live mealworms given a choice, which provide higher nutritional value. You can buy mealworms at birdfeeding stores or online at sites selling live pet food. To learn more about bluebirds and how to help them, the Michigan Bluebird Society will be holding its annual Spring Bluebird Festival on Sat. March 30th at the Prince Conference Center in Grand Rapids. This educational event will include programs on bluebirds and other bird topics, a Bluebird Expo featuring products for sale and nature/environmental exhibits, a Nest Box Building Workshop, kids’ activities, and nature hike at the Bunker Interpretive Center. The keynote program will be by author and zoologist Doug Tallamy, who will discuss how to create in your yards, diverse and healthy ecosystems of insects, birds, and other wildlife using native plants. To register, or obtain more information on the event, go to www.michiganbluebirds.org/springfestival. Kurt Hagemeister is President and co-founder of the Michigan Bluebird Society, a non-profit, 501(c)(3) organization dedicated to education and conservation of bluebirds and other native cavity nesting birds. He has been a bluebird landlord for over 20 years, authored articles on bluebirds, and presented programs on them across the state.